After three Scary Stories to Tell in the Dark Power Rankings articles (here, here and here), as well as another post delving into some of his more obscure horror artwork, you can probably tell that the artist Stephen Gammell has a special, terrifying place in my heart. It therefore always brings me great joy when I find Gammell's artwork lurking in the most unexpected of places. 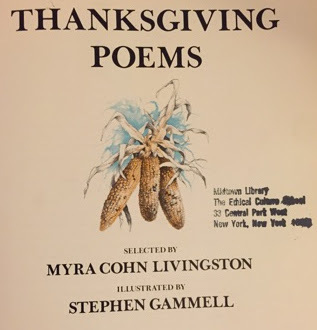 Like, say, this book of Thanksgiving poetry.